I don't know how many unused oils rigs lay wasting in the Bright of Benin which is off the coast of Nigeria's delta region but these facilites have the potential to be put into good use. 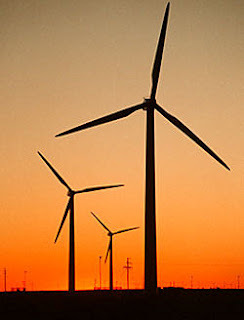 Wind turbines could be erected to generate electric power for the rual coastal communities of the Niger Delta. John Goghegan of wired.com writes in an article "Inherit the Wind" about how littered carcasses of unused oil platforms in the gulf coast could be used as the backbone of the first offshore wind farm in the United States. "...The port of Iberia has never been busier. Situated on a narrow canal leading to the Louisiana coastline, the docks here throb with the sound of tugboats towing oil platforms to and from their anchorages in the Gulf of Mexico. When a drilling site is depleted, the platforms return to port; the docks are littered with rusting steel hulks waiting for their next run. 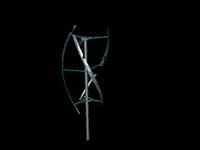 Click on Image on the Right to view animation of the new wind turbines design. In December, though, one of these platforms, stripped and refurbished by a local startup, returned to sea with a new mission. The first of a flotilla to come, it carried wind-monitoring equipment as well as radar for tracking migratory birds. Those that follow will be topped not by drilling rigs but by windmills. The turbines are bound for an 18-square-mile area roughly 10 miles off the coast of Galveston, Texas, where the first offshore wind farm in the US is under construction. That’s right: The flower of sustainable energy is blooming in oil country. Get ready for the Great Texas Wind Rush. Wind energy is the most promising carbon-free, nonnuclear alternative to fossil-fueled grid power. But regions with enough space and breeze for land-based wind farms—mostly in the Midwest—are far from coastal population centers; the cost of running transmission lines between generators and users is a major disincentive. That’s why wind-power entrepreneurs have set their sights on coastal waters. In the Atlantic, off Cape Cod, the 450-megawatt Cape Wind installation has been in the works for five years..."
The CEO of Environ Mission Roger Davey talks about new technologies that will reduce the height of the solar chimney project. These technologies include new materials that retain heat better and saline heat retention ponds etc. This is the Environ Mission Solar Chimney Video. Roger Davey's Interview by PESN.com can be listened to here. The technology that was once restricted to producing prototypes in CAM (Computer Aided Manufacture) and RAFT (Rapid Automated Fabrication Technologies) industry is now being proposed to print buildings the way you print pages from your computer. "...Freeform Construction is a truly adventurous and far-reaching new construction method which will change the very future of building and construction as we know it. 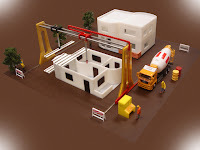 It will revolutionise the way we build, it will enhance existing construction processes and bring about new capabilities for the construction process, and it will allow us to build in ways which simply weren’t possible before..."
"...Freeform Construction is about ‘printing’ buildings, as if you were printing this page. It’s about combining the whole design, construction and maintenance process into a seamless operation to produce structures and components which meet the challenges of our changing world and which will allow us to build on any terrain, against any backdrop, anywhere on the Earth, the Moon or Mars..."
Andrew Blum of Wired Home writes about high tech method of building green buildings developed by Steve Kieran. 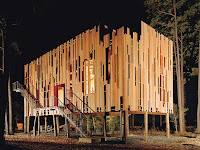 "...Snapped together from a combination of modules, panels, and preformed structural frames, the Loblolly house, named for the loblolly pines here in the Maryland tidewater area, is a manifesto for a new way of building. Architect Kieran and his partner, James Timberlake, have long been known for their finely crafted and energy-efficient buildings and materials. But the Philadelphia-based pair wanted more than just high-profile commissions – they were looking for a breakthrough technology that would let them make smarter, greener structures that could go up quickly and cheaply..."
"...In 2001, after studying how the automotive, aircraft, and shipbuilding industries had revolutionized themselves over the previous 15 years, Kieran and Timberlake realized that architecture needed the equivalent of an integrated circuit. They began to combine glass, drywall, pipe, and wood frames into finished units, each precision-engineered for cost, beauty, and sustainability. In the Loblolly house, the walls and floors are made of panels (some as tall as 21 feet) that were manufactured with wiring, insulation, plumbing, and ductwork already in place. And the main power systems of the home, including two bathrooms and the galley kitchen, were delivered to the construction site in preassembled, plug-and-play units. After the site was prepared, the 2,200-square-foot house took three weeks to assemble..."
"...THE MOST EFFICIENT WAY to construct a house is to build it in a factory. This reduces a home's "embodied energy" – the amount of power expended in its fabrication and construction. And conventional homebuilding is dirty work. From the fuel used by commuting workers to onsite diesel generators, the construction and operation of homes and other structures generates 40 to 50 percent of all the greenhouse gases in the US, according to the US Energy Information Administration. On top of that, studies suggest that more than half of a home's leftover materials – drywall and lumber – winds up in landfills. Plus, as anyone who has ever remodeled a kitchen knows, construction work isn't exactly high tech. Raw materials are dropped off at the building site and then assembled by hand with hammers and saws. The so-called material systems approach developed by Kieran and Timberlake banishes this primitive model. Better still, it's future-proof: Homes may be built to last, but the modules of material systems structures are built to be upgraded..."